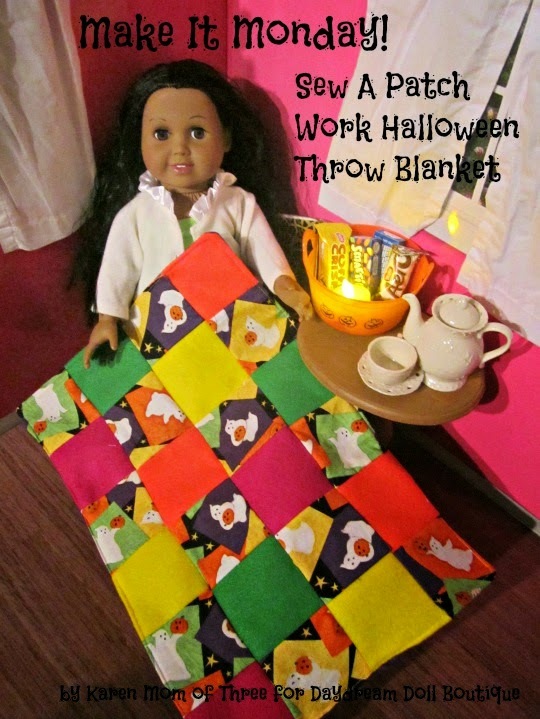 Karen here and for today's Make It Monday craft tutorial I have decided to share a very easy and fun way to create a great patch work quilt for your dolls. 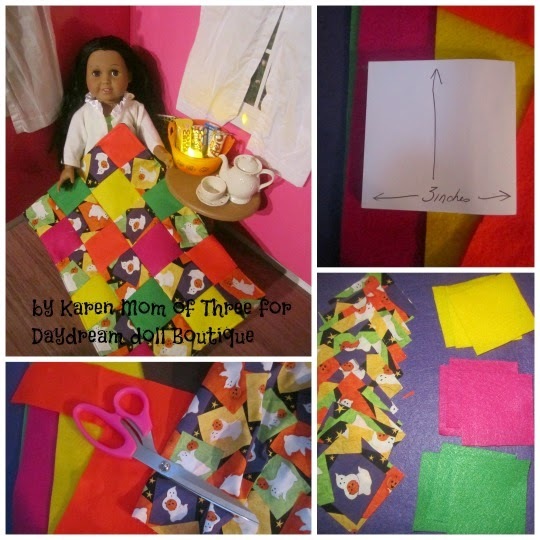 This is a great way to practice your sewing and a perfect first quilt! Step 1- Use your ruler and cut a piece of paper 3 inches square. This will be your pattern piece for your patch work squares. 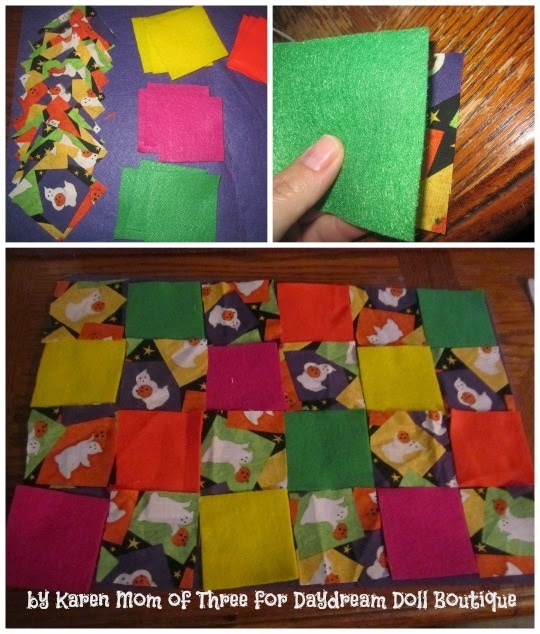 Step 4- Once you have your pattern selected begin attaching the fabric to the felt. Make rows of 4 squares by 6. 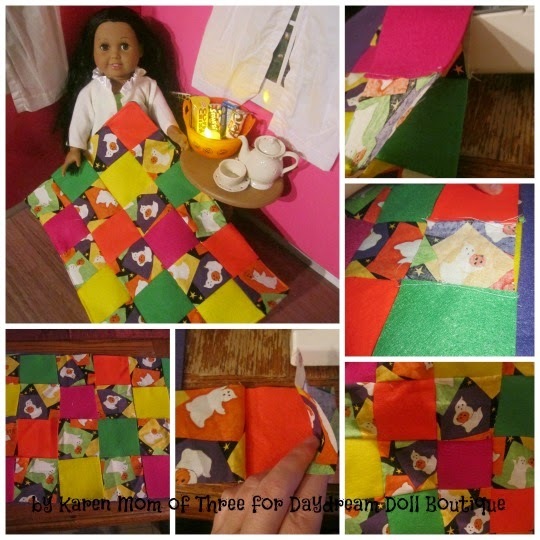 Use your sewing machine and begin stitching fabric to felt.. Repeat by attaching all the pieces in your 4 rows of 6 squares. You will create 4 strips of 6 squares. Step 5- Once you have all 4 strips sewn begin to sew them to each other. Put the patterned fabric facing each other as you sew your strips. Repeat until all your strips resemble the top of your blanket. Step 6- Turn your now created front piece of your quilt pattern side down on your large piece of 12X18 felt. Pin into place and sew along three sides. Trim the edges and turn it right side out. Pin the open end closed tucking the raw edges in as you go and sew shut, continue stitching along all sides of your blanket. Now your blanket is ready to use!